See how SIGMASOFT® Virtual Molding is used to identify optimization potential in a real production process when going from prototype to serial production. Through a deep understanding of what is happening within the part at each stage of the molding process, it is possible to reduce cycle time without sacrificing part quality or compromising the mold performance. Figure 1 – Temperatures at original (left) and reduced (right) cycle time. Despite a shortening of around 50%, the part temperature is still acceptable for ejection. This article highlights how the technology supports decision making during the transition from prototype to serial production in injection molding. At the same time it also helps to substantially reduce costs and make the injection process more profitable. In an industrial example a complex part out of PA 66 GF 35 should be produced. The complexity of the product called for a challenging ejection system, thus a prototype mold was built. The concept worked, parts were produced with the required quality, but when serial production started in the real mold, the cycle time was too long, despite the small size and low wall thickness of the product. SIGMASOFT® Virtual Molding helped to identify the optimization potential of the current process. For this approach, the complete mold, with all its components, was introduced in the software under real processing conditions and “virtual parts” were produced for 20 cycles. An analysis of part and mold in the 20th cycle showed that the part temperature is well below the recommended ejection temperature when the mold opens. Additionally, a too long packing pressure was identified. As a consequence, times for packing and residual cooling were shortened. Further optimization potential lay in decreasing the handling times. In total an about 50% shorter cycle time was possible for the process. While at the same time, residual stress inside the part was still uncritical and the deformation lay within the required tolerance. 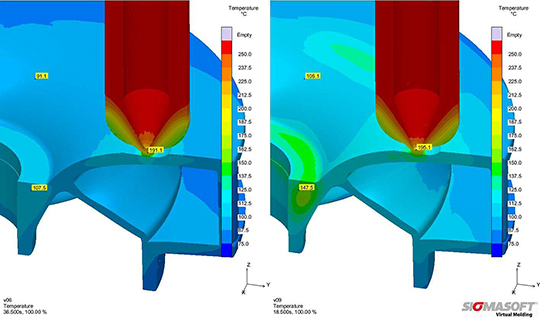 This example shows how SIGMASOFT® Virtual Molding helps molders to make sound decisions in the process set-up. Instead of blind iteration in the machine, the software effectively reveals potential for cost reduction and cycle optimization, without sacrificing process stability or part quality.